There’s nothing like having a newborn to make you appreciate having a nice spot to do laundry. Ours functions just fine, but I’d say it still falls a bit short of “nice” in the looks department. So we’ve decided it’s major overhaul time. Things have made minor progress since the beginning. Blue trim was painted. Old blue bi-fold doors came off. Flooring was replaced. Hallway walls were painted. And, oh yeah, we unexpectedly had to buy new appliances. I actually bothered to spray those bi-folds white back when we painted the trim and doors upstairs and they’ve been living in the storage room ever since. Once every few months Sherry and I talk about re-hanging them and always end up in the same place: “but it’s so nice to just have it open and not have them in our way.” I think we’re just fans of small spaces that are open as opposed to small spaces that are closed off (with the exception of bathrooms of course). Heck, in our first house we even demo’d out the bi-fold wall in favor of a more open laundry setup. We often rely on Phase 1 updates to inexpensively improve rooms like bathrooms and kitchens while we save up & plan, since they can be a lot pricier to fully redo (and can call for tons of function/layout/material decisions that we like to think through) but this small laundry corner should be a lot more affordable, especially since we already have new appliances. So as long as we can both get to a place where we’re 100% sold on our approach, we’re ready to get down to business right now. But getting to that 100% sold place isn’t always easy. There has been a fair amount of debate about what we really want from our laundry area since deciding it would be our next project. Sometimes I think the most important part of DIY is thinking. Not to the point that you never do anything and keep re-hashing everything until your house stops moving forward at all and you’re frozen for a year in place – but enough thinking so that you’re not rushing into the whole “doing” part without being sure about your approach/materials/layout/etc. So this weekend we had fun with the family, went to the best neighborhood party ever, and did a whole lot of thinking. Not an ounce of doing. Unless you count tile shopping, but we’ll get to that in a minute. Having that wall out of the way would also be a good invitation to pretty-up the space. We really want to add a tile backsplash to bring in some texture and bounce around more light in this dark end-of-the-hallway, and a floating shelf along with some upper cabinets and a nice light fixture could go a long way. Here’s a shot of the other corner, which is where we were thinking a base cabinet with drawers would go after everything shifted over. It would add more storage, plus we could top it with a small piece of countertop (maybe remnant granite?) for more surface area. In the floor plan we noted the possibility of a door. We thought a pretty door with a large frosted pane in the middle like this would still let light in (and could be left open for a nice breathable feeling while doing laundry) and it could be closed to dampen sound and seal off the room when things are running. We both like the idea of making it more of a laundry room and not just a laundry spot-at-the-end-of-the-hallway. 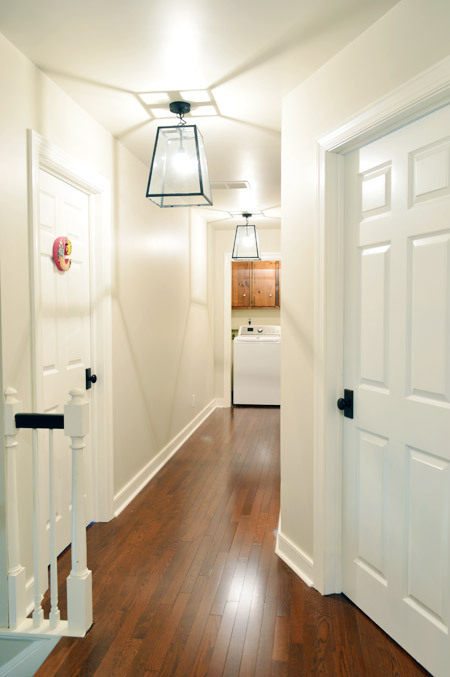 We also think it would help that long part of the hallway feel less cavernous, but we aren’t 100% sold on adding it yet. For one, we may end up liking the look of the finished laundry wall so much that it seems silly to pay money to hide it behind a door. And the sound of the washer/dryer haven’t bothered us since upgrading them, hence our resistance to rehang those old bi-folds. The big vote against this idea is…. we’re both grappling with the idea of having two doors to pass through to the storage room – especially once that space becomes a finished TV room/bunk room. Right now as it stands, you’d walk down the hall and open a door at the end of the hall to enter the bunk room/TV room, but if we added a frosted door in the hall to make the laundry nook into a bona-fide laundry room, you’d have to walk through the laundry room to get to the room beyond it. That could be weird, right? Option #2: Leave the cased opening as it is right now, and work on the back wall (add tile, floating shelves/cabinetry, update the lighting, etc). We can always add nicer bi-fold doors down the line to close things off if we’d like, and even if we don’t, it’ll have more of a finished nook-look than just being an open laundry area at the end of the hall (we think the framed out trim feels more polished than something that’s all open might). The nice thing about choosing this option is that we’re not tied to anything until we’re sure. We can work on that back area, and if we suddenly have a moment of clarity about removing the cased opening and adding a frosted door in the hallway down the line, we can (meaning Option #2 can easily morph into Option 1). And if we just want to re-hang some nicer bi-folds later, we can do that too. Or leave it open. The world is our oyster. And seeing inspiration rooms like this one (found here) confirmed that choice. If a little laundry nook with bi-folds can look this good, well, that’s pretty convincing. UPDATE: There have been a bunch of questions/suggestions for everything from adding a pocket door behind the guest room or stealing the guest closet completely to moving the washer & dryer to where the current storage door is and adding a new door where they currently sit (or adding a barn/sliding door), so check out the comments for explanations on all of those possibilities. 1. This mini-subway look in marble was really elegant and classic looking, but we both wanted to try something a little less basic. 2. We liked this fun small scale hex tile, but the deep colors made us worry that the laundry room would feel darker instead of brighter. 3. This one was amazing in person, but at $20 per square foot it was the priciest one we looked at by a long shot, and we thought the scale might be a bit large for such a small area (it would be amazing on the back wall of a giant shower though). 4. You know we love penny tile, and this shiny milk-colored option was really charming, but we wanted to try something new since we did penny tile in our last kitchen. 5. 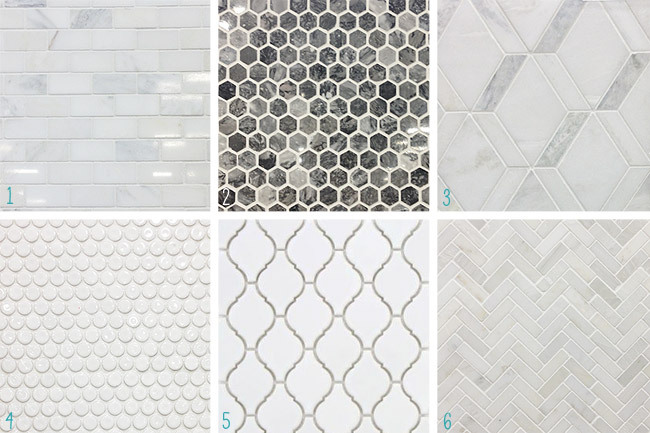 We always like white lantern tile (we had fun using something similar in a showhouse bathroom) but the bright white color wasn’t exactly the same as our washer/dryer, so it made them look off/clash by comparison. 6. We really loved this herringbone patterned tile, and the light marble looked like it would reflect a lot of light without being too shiny (the finish felt extra luxe in person). We also liked the scale (larger than #4, smaller than #3) and we also liked that it had a variety of tones and looks great next to our white washer & dryer. Spoiler alert: That’s is the one we got. It felt really high end, the price was right (after the 10% off YHL10 coupon code it was around $12.50 per square foot), and they only had a few boxes of it left, so we were so lucky to get to it before it went out of stock. So that’s what’s going on with the laundry room. Here’s hoping we can figure out the whole shelves/cabinetry thing, and get started on tiling. What did you guys do this weekend? Family stuff? Travel? Tons of thinking? It’s kind of an important DIY detail, right? So excited to see how this evolves – loving the marble tile inspiration, it’s gorgeous! Love the inspiration! Also… poor Santa! Haha! 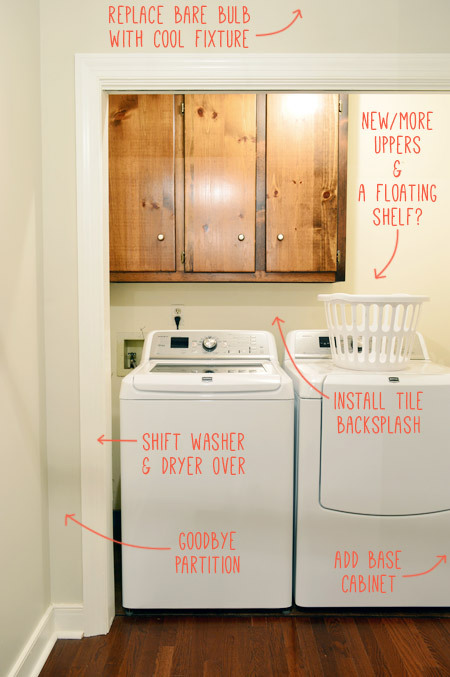 Since your washer is top loading, won’t that get in the way of having cabinets or a floating shelf above it? I feel like you’d have to hang the cabinets so high that you wouldn’t be able to easily access them? Ah, I understand what you mean, they don’t stick out enough to interfere. Makes sense! That could work too I think, although doors might look cleaner. Not sure! Yay for laundry room makeovers and working with what you have! We’re nearly done with ours and it feels so great to have a snazzy place to do a boring chore! I love the marble herringbone (we debated it for ages for the bathroom reno) and can’t wait to see it up! Maybe you could find a really cool finish for new bi-fold doors that would look cool at the end of the hallway. I vote that your best choice. Totally weird going through two doors. That last photo of the laundry inspiration picture was beautiful. Can’t wait to see it! It’s obvious that the laundry was an add on, it’s an odd placement. And if you didn’t want the storage space to become PUBLIC, it’s fine – that’s what the prev owners did. And it could be several sorts of cool “secret/quiet” rooms. BUT for a very public space (even though it’s on the second floor it will be I assume used by friends and family quite a lot) – then a room behind/through the laundry room just looks/feels weird. I’ve flipped several homes, and while moving walls and plumbing might be disruptive, it’s not really difficult. I think the laundry needs to be in the guest room (plumbing available with the bathrooms), and open up that wall/hallway into a proper room/guest room – add the closet and bath while you are at it so you don’t lose a bedroom and it will become a wonderful space that makes sense in the home. Love that tile, and the inspiration laundry room! Beautiful. Good pick guys, can’t wait to see the finished product. I LOVE option #1. I think that you guys should just go for it. 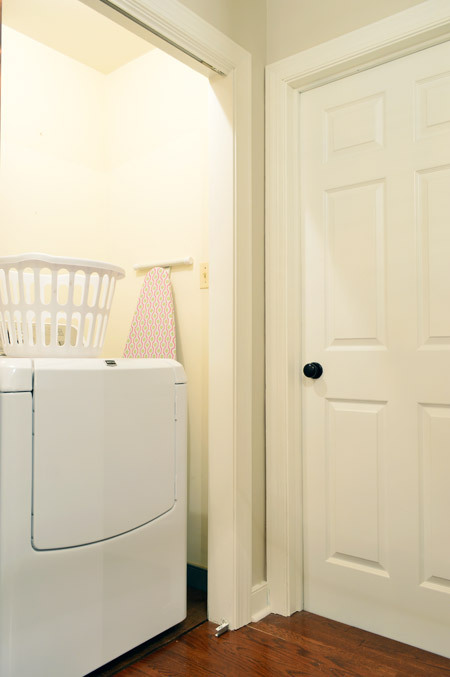 Having a dedicated “laundry room” that you can close the door on and hide your “back from vacation” laundry or “I’m washing all the linens in the house” laundry is always a great option. And I don’t think that having to go through two doors to get to the bonus room is weird at all. I actually think it’s great not only to make the laundry room a dedicated space but it also would give that bonus room more of a “hide out” feeling. And if the kids were up there hanging out you could always leave both doors open anyway. Great ideas guys. What timing, Wolfy and I started working on our laundry room last weekend. Of course it was just a storage room so the whole house is a mess right now. I had the same idea you guys had, moving our laundry into a close and adding a backsplash and better storage. Can’t wait to see how yours turns out! As a mom of three, I like the idea of option A! More space for laundry in my world would be so nice. Especially this time of year with towels and bathing suits! And it might even allow you space for an indoor wall mounted drying rack? Good luck, looking forward to following the process. Wow what a gorgeous laundry room you created! I LOVE that backsplash. I would have never even thought to put that in a laundry room. Looks fab! I think option two. I would open up the walls, scoot everything over to the left and have one large shelf on the right for everything. I think I would even put some of your bright spring curtains there on a rod to open and close. I think extending the laundry room out will defeat your purpose of trying to open up the space. It will make the hallway look smaller too. I second this idea – you could even use something like the blinds in your first laundry space. When Clara and Teddy are older and want to hang out with their friends in the TV room – that might be the time for the extra door! Plenty of soundproofing for you and the ultimate teen clubhouse for them! The guest closet has some stairs to the attic that cut into the ceiling at an angle so I don’t think a pocket door would fit in there. Such a fun idea though! Is the YHL10 coupon code for the Tile Shop? It seems to not be working (but maybe they won’t combine it with the 20% 4th of July sale)? Yes I think it can’t be combined, but for non-sale tile you can get them to honor it by calling (if it doesn’t work online) or just asking for it in the store. You might enjoy adding a Solar Tube to that space. We have three in areas with no windows. (Two baths and the upstairs hall). We love them. I’ve been debating adding a door to our open concept laundry area too. Its such a tough decision. This laundry update has me wondering if Teddy has grown into his cloth diapers yet. We need to check! I bet he’s big enough now! Laundry rooms must be in the air right now! I am still loving my redo inspired by your little octopus. I’ve had lots of compliments and people asking where I got the idea. I tell them…well it started with that little octopus from Young House Love. Thanks again! You’re so sweet, I love that! Same here, we got a new washer and dryer delivered early sat morning and have been working on the laundry room all week. Sadly we didn’t really get any further than tearing the room apart (too many holiday festivities!) before I got so anxious that we had to install the washer and dryer. I couldn’t deal with leaving them in the den all wrapped up for another week. We’ve decided to do a pallet wall behind the w/d (the wall is like 16ft high) and tile the whole knee wall around the room. It’s going to double as a laundry/foster room, so tile will be awesome with messy puppies and kittens. Love that you picked the marble herringbone from the Tile Shop. We’re starting a bathroom reno and the Tile Shop told me to not even look at that tile since I can’t get it until December! In stock, they can get me a bigger option that is only in stock since they don’t have the boards out. Done! I think it’s going to look great! Hey there! Love the options. #1 would be weird once the storage space is converted, but I think it will be so pretty you won’t want to hide it anyway! I think you have to call to get them to apply it or ask in the store like we did (it’s manual for them I think). while i like option 1 the best i like option 3 better. i would turn the washer/dryer 1/4 turn clockwise and seal the existing storage room door. then open another door where the washer sits now and extend the hallway. 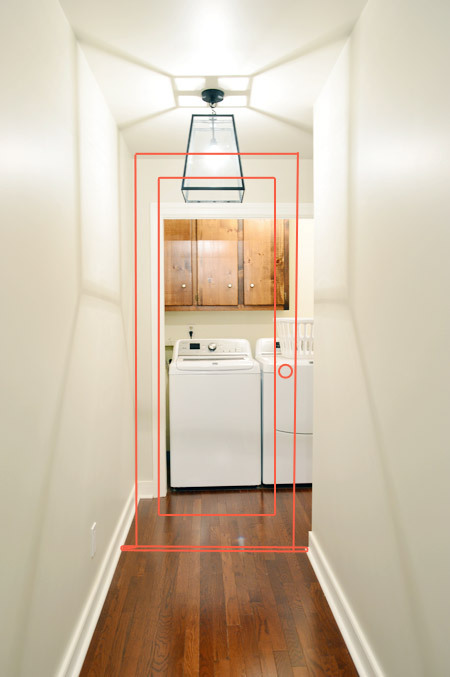 it would move the appliances out of direct view AND solve the 2 doors problem. depending on the actual measurements it would possibly give you room for even more cabinets/storage. Never thought of that! That would mean moving the hookups for them, and the stairs that lead to the attic from the storage room would be right behind them so we’re not sure if that would work. Such a fun idea though! I agree with Jim. I would try to “steal” some space from the storage room. If your kids grow up to play sports, you will spend more time in the laundry room than any other room in your house! Can’t wait to see the results either way. I love Jim’s idea, too! Moving the laundry off to the right and having a door straight ahead to the bonus space would make it feel more like an intentional part of the whole upstairs rather than something added on later. It would be a pain to move the hook-ups, I’m sure, but possibly very worth it! 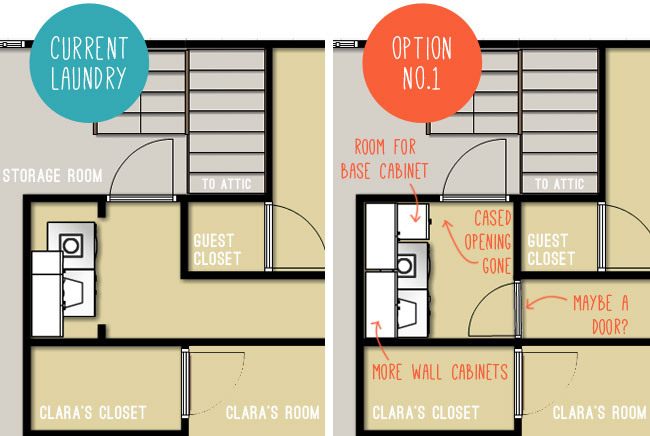 YESSS then you could do a secret entrance to the future bunk room from Clara’s closet! How FUN would that be?! Clara’s closet has a slanted ceiling (due to the roof over the garage) so we don’t think a door would really work there. Yes! This is what I was thinking. Only the attic steps would need to be rerouted so they are in an L shape, and the washer and dryer share a wall with the bottom side of the rerouted attic steps. 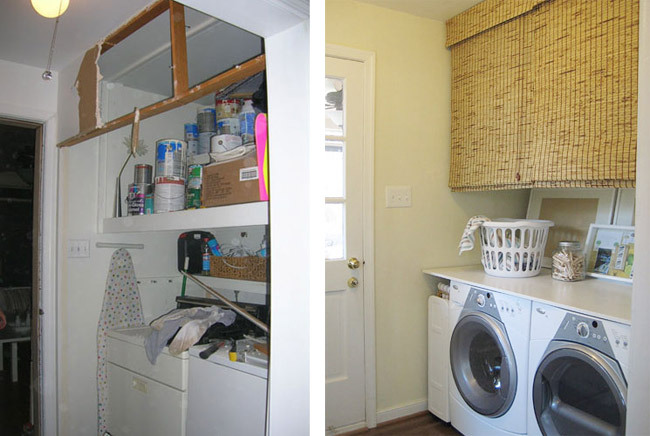 Gives you so much more space and a walk-by of the laundry room instead of a walk-through. I don’t understand why the attic would be more difficult to access if you shifted the appliances 90 degrees clockwise and put the entry to the storage room in a different spot. As it is right now, you have to go into the storage room to get to the attic, right? And if you put the doorway to the storage room where the washer currently is, you’d still have to go into the storage room to get to the attic… you’d just get to the storage room in a different way. Nothing would have to change beyond the existing walls/doorways of the laundry room. If your floorplan is accurate, it looks like there would be plenty of room to put the dryer where you see the words “cased opening gone” on Option #1, with the washer beside it. Maybe that area isn’t as deep as it looks in the drawing? The drawing isn’t perfect, but the main thing is that moving the hookups to where that door is would make that wall deeper than the door that’s there now (we’re talking about losing around 12″ for those hookups, whereas the door is around 2″ thick now). So the landing at the foot of the steps would only be around 15-18″ wide (meaning bringing things like the Christmas tree down the attic stairs would be really cramped). We just aren’t convinced that all the time/money spent moving the appliance hookups is worth it only to have exactly the same sized laundry room and a more closed in attic landing. In the little drawing it looks like there’s a landing leading to the stairs (i.e. where the current door opens into the storage space). Correct me if I’m wrong, but wouldn’t the hookups be run up the inside of wall? They’d rough-in to the “new” laundry room and you wouldn’t lose any space behind the wall that’s already there. I’m not quite sure how this would interfere stairs. You really need 12″ of wall depth for the plumbing? It’s not so much about having the view of a door at the end of the hallway as it is about traffic flow to/from the future playroom/bunkroom. With your current layout, say you’re doing laundry and Clara, Teddy, and their friends are going into or out of the playroom. If you have a hamper, drying rack, or ironing board on the floor in the laundry hallway, then that blocks access to the future playroom door. Building a dedicated laundry room would allow you to have space for any of these laundry items, or you would even have space for a laundry sink, or more cabinets if you put them in an “L” layout. Then the hallway is left completely open for walking through to the playroom. Also, is the storage room currently heated and cooled? If not, when you convert it in the future you will need a door to separate it from the attic stairs/space, and I’m not sure the current layout would allow for a door at the bottom, or the 2 doors would be swinging into each other. Just some additional thoughts :-) I love the tile you chose, I’m sure it will look lovely in your space! Thanks Meredith! That certainly is a compelling argument. We do have to get everything insulated in the future, but had a framer look at it back when we lofted the sunroom and he thought it would be pretty simple without moving the steps. Will share all those details when we get there! While I definitely see how closing off the current storage room door would create some extra turns to get around when carrying the occasional bulky item down from the attic, I still don’t think your rationality for dismissing this idea is justified (at least from a spatial perspective). As an architect who JUST finished building out a new laundry room in my own home, I can attest that the wall needs to be only about 5” thick to accommodate the washer/dryer hookups (standard 2×4 wall construction, with drywall… with the dryer venting to the exterior). Saying that the door is only 2” thick doesn’t even matter – the door is in a WALL that is likely 5” thick, as are all standard residential walls (again, 2×4 construction). So assuming you have enough space to at least open the current storage room door (likely 30” deep), you would have enough space to access the attic stairs. Furthermore, if you DID need to thicken the wall for some reason, you could always thicken it into the hallway rather than into the attic entrance. All of that said, there’s of course a greater financial commitment with this scheme. 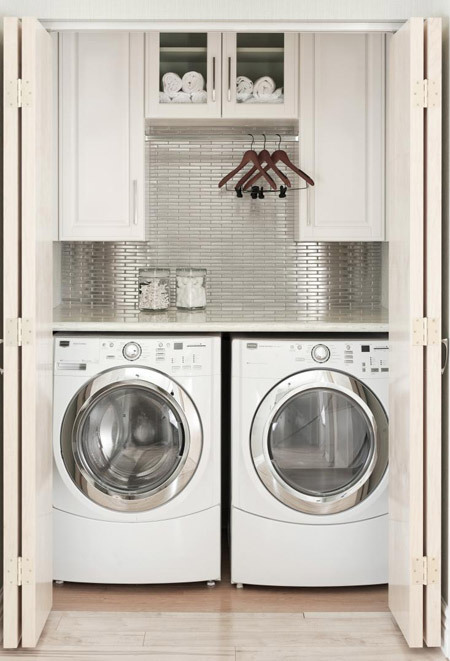 The overall idea of rotating the laundry space is very intriguing and would solve several issues with your current arrangement – terminating the hallway in a “neater” way, creating a separate nook (or even room if space allows) for 2nd floor laundry. As a reader it would be interesting to see you guys push the limits of modernizing this house rather than take the easy way out by simply beautifying an ugly spot, when a slightly bigger intervention could ultimately function better for you overall. Ha, I wouldn’t call myself “passionate” about your laundry room…….. Of course it’s your house and you can ultimately do what you want with it, and no one expects you to change plans for the sole purpose of appeasing readers/creating blog content. Architects and designers deal with these kind of problems day in and day out and our ability to find the most copasetic solution is what sets us apart from the average person who can’t quite “see” spatial solutions. So how about changing your plans for the sake of good design? Or at this point, even just better design? I felt compelled to throw my two cents at an inspiring idea that was being talked around without proper knowledge and investigation. I’ve read your blog from the beginning and notice that you tend to dismiss nearly every commenters’ ideas with a slew of (sometimes) defensive rationality, despite valid cases. The more we think about the possibility of that window being seen down the hall, the more we love it! Just hoping the bids don’t come in too high (at some point we’d rather put the big dollars towards things like the kitchen redo). Will keep you posted! My vote is for this one! I feel like it would be weird to go through a laundry area to go into a hang out room. This is exactly what I was thinking. It does involve moving plumbing, so a bigger job, but then the hallway no longer looks to appliances & the appliances are tucked away without having to be behind a door. Love the tile you chose. 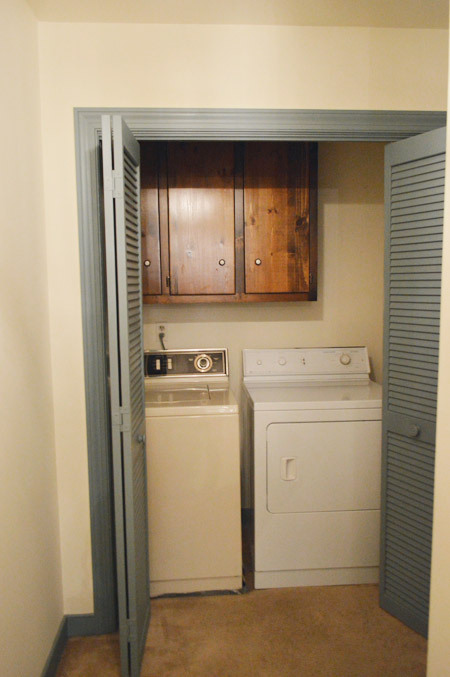 Can’t wait to see the finished space because I have a laundry closet almost exactly like this. I have a question about your hall lights though – what type of light bulbs do you use in them? Our hall lights seem to cast a yellowish glow on our walls and I really like your bright-but-not-to-harsh light. I like the inspiration room a lot! Hanging space is a top priority for me in a laundry space, but it must be high enough that the clothes don’t drag and get in the way. We have a wire shelf that stretches all the way across our laundry room. Lots of storage on the shelf, hangers can hang above the washer/dryer, and clothes get hung off to the side of the dryer so that even long items can be hung to dry easily. The dog bowls are on the floor next to the dryer so that space isn’t wasted either. I think I would remove the cased opening for easier access and more options. You could always hang pretty curtains across the opening if you didn’t want to see the laundry area. Can’t wait to see what you do with this space! This may be the kick of inspiration I need! So over our laundry closet with 1 wire shelf. LOVE your inspiration! I may go the wallpaper route. I just saw that target is carrying peel and stick paper and I am intrigued! Can’t wait to see your space evolve! I do so much laundry that I find myself dreaming of a day when the laundry space feels prettier and more functional than it does right now. (And no, never in my life did I imagine that a sentence like that would become true.) I love this project and the tile you’ve chosen – can’t wait to see how it comes together! Do you think you might use the bifold doors in another way someplace? I’m not sure! We repurposed an old door at our first house to make a double desk which later became Clara’s drawing desk (we made it smaller) so anything’s possible! I’m excited to see the end product!! I’m in the process of pulling my parents’ laundry room together! Hello Petersiks! :) I thought you should know, when I clicked over from Facebook this page had a pop-up add. I took a screenshot, so I can email you what the pop-up looked like? Argh, thanks Linley! We’d love to see it so we can block it! There’s a contact us button on the bottom of our site where you can send it. Thanks again for the help! Love the tile choice! I have a very similar type laundry area across from the tub in the main bathroom. It is a deep enough area that even with the w/d out from the wall a narrow soft side laundry sorting bin can hide in front of the set and the bi-fold doors will still close. We plan on putting storage cabinets above the w/d set some day and painting the area. Love your ideas! Will have to rethink mine a bit now! I love Option 1! We have a similar laundry closet, which feels crowded and the floor is hard to clean. If you opened the space, could you put one of those sliding barn doors behind the guest closet? I can’t wait to see the finished room! We thought about that but it might feel a lot heavier/darker than a frosted door in the hallway, so we think that would make the laundry area feel less closed off if we go the door route. If you go with removing the cased opening, do you have leftover flooring to patch the floor? We have one extra box of flooring left, thank goodness! I’m sure that whatever you decide to do will look lovely! I’m still in the thinking stage of our current laundry room, so I can’t wait to see your results. I really miss my happy little laundry room from our first house that I redid myself. We have a totally different layout with this one, so I’m still mulling over some ideas. Oh, I am so going to be taking tips from y’all on this one! We have a laundry nook in the new house with TONS of space above the washer/dryer with a single granite shelf there now… there is so much room to work with up there, but I just have no idea what to do with it. Love the tile you selected — what a great idea! Do you guys still do the reader dilemmas? I have a dilemma – my washer/dryer is in the basement so all the cords/cables are mounted to a board on the wall, because of the cement….YUK! I just want a pretty laundry space! We’d love to get back to doing those! Anyone have tips for Keri? hello. pegboard. thank you guys for the awesome ideas!!! 7/07…enjoy your special day! Happy 7th Anniversary! Lucky 7, that is! We bought a new sectional sofa this weekend. Ordered it in a lighter gray velvet and now I’m wondering if we went TOO light! Fingers crossed that it works for our grubby family! Thanks Pamela! And the sofa sounds awesome. Crossing my fingers that it’s perfect! the penny tile is just so dang cute! I wanted to throw my two cents into the mix! I once nannies for a family that had a very large home. Well, one day while in the children’s bathroom, I opened a door thinking it was the lining closet. Nope, turns out they had a VERY cool hidden/secret room! It was an office/tv room and pretty cool. I was dumbfounded! It basically was hidden in plain sight, but you had to go through that bathroom to get to it. So, it’s not as weird as you might think!!!! Good luck with the planning and happy, happy anniversary!!!! That sounds so cool! Thanks for the tip Beth! It’s so interesting to hear how you guys fall on the issue! It all depends if you plan to develop the storage space in any way to livable space. If you do not plan to convert the space to livable spacethen Option 1 by far is the smartest option. 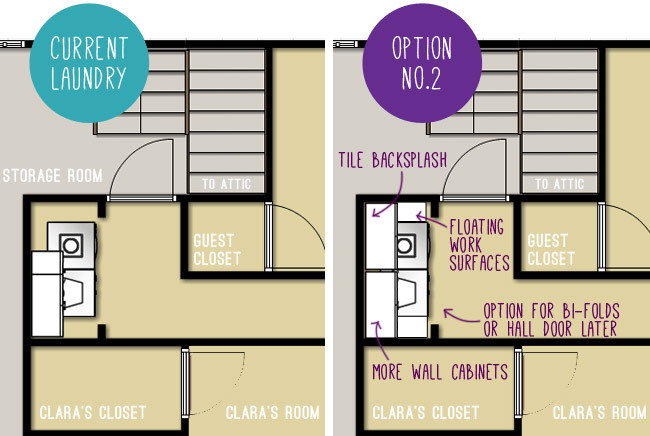 If you do plan to use the storage space as eventual living space then I would consider a modified version of Option 2. So you could maintain a naturally flowing hallway into the future finished room you are planning on using the storage room for. I love the herringbone tile. Your laundry room is going to look fab!! I can’t believe all that you have gotten done since you moved in! It looks amazing! So cute! Sounds like you got a ton done! closets like you did in first house master bedroom in guest room. getting ready to get rid of our quest room closet to open in hallway for a linen closet…then going to add ikea type closets along one wall. love all your ideas! Thanks Stefanie! In our first house we had an actual closet in that bedroom as well as the Ikea storage we added (for resale in our area, rooms without proper closets don’t count as bedrooms, so our house would technically become a three bedroom if we took that closet out). Not sure we’re ready to do that! Love the tile! I agree with you that adding a door at the end of the hall might be pretty awkward when/if that back room becomes actual living space. And I think at almost 3 months old Teddy is pretty well past the newborn phase – it goes so fast doesn’t it!? Oh no! He can’t be! Time needs to stop right now. Haha! What if…..(I’m so good at spending money that’s not mine) you take a portion of the guest room closet (it looks deep on diagram) so the laundry room is bigger, maybe for a laundry folding table, pull down ironing board, hampers, more shelving….whatever you need. So knocking down that wall and re building it back into the guest room a few feet? You could even take the whole closet. Use ikea open system for your guests or a cool armoire. The attic stairs slope down in the guest closet, so it’s not a full height area, which means we can’t really steal from it. Wish we could! As for stealing that whole closet space, in our first house we had an actual closet in that bedroom as well as the Ikea storage we added (for resale in our area, rooms without proper closets don’t count as bedrooms, so our house would technically become a three bedroom if we took that closet out). Not sure we’re ready to do that! When I revamped my laundry closet last year I added a floating shelf above the washer and dryer along with a couple of cabinets and rod for hanging clothes to dry. LOVED that combo so much that I’m thinking about recreating it in our just purchased new house! You can see it here. I don’t know if you ever use vinegar while washing clothes but if you do then I would nix any granite and stick with something that won’t break down if you spill some. We have granite in ours and I’m always having to be extra careful because vinegar can really damage them. I love the tile btw, and can’t wait to see how your laundry area turns out – I am eventually going to redo my laundry space (which also is our 3rd bathroom) and am already making decisions about tile, counters and storage. Great tip! We use vinegar a lot! I’m interested in what type of counter you end up with. I was wandering around Lowes trying to get ideas for a folding area on top of my frontload washer and dryer and the associate nixed everything I looked at. Too heavy, not if bleach will spill, etc, etc. I got the feeling he just didn’t feel like working. ;). BTW-sounds like some well-meaning peer pressure from reading all of the suggestions. Good job staying true to yourselves. And Happy Anniversary!!! I would consider a pocket door at the end of the hall. Since you have the guest room closet on the other side of the wall, there may be room to have one. Then it can be closed when doing laundry but left open and out of the way most of the time to get to the storage/bunk room. Love your ideas for your laundry re-do! Btw, I had a pop-up while on your site today. I’m sorry that I forgot to screen-shot it; I think it was a “survey” for Triscuits. We wish! 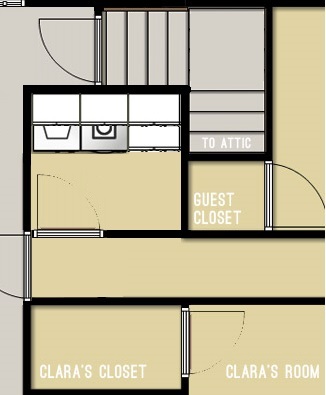 The guest closet ceiling is sloped due to the attic stairs, so a pocket door wouldn’t work there. Love that idea though! And ack about that dang Triscuit popup. We have been blocking that thing for days. Sorry it keeps coming back. It’s the pop-up with nine lives! Love that you guys are working on this project next — our laundry area is similar (i.e., in a “closet”) but is included in the full bath in our basement. I’ve been dreaming of adding a tile backsplash in the pedestal sink alcove that would also match (or at least, go with) a tile backsplash behind the washer/dryer. I haven’t done a ton of research on this yet, but figured y’all would know — are there any considerations when hanging that much tile on a wall? Haha! We’ll share our tiling adventures when we get to them. The folks at The Tile Shop gave us some great tips for hanging this stuff, so we’ll keep you posted! I like option 1 but without the door. If you go with option 2 you are losing what looks like at least 2 feet of extra storage. I would also turn that space into a laundry sorter if there is enough room. Just 2 extra large drawers. That way you could hide the mess. I love option 1! But I would turn the storage room door into a pocket door so it doesn’t feel like you’ve got fun house doors going every which way when you add the hall door. You could even add a fold down counter on the wall opposite of the machines for added folding and sorting space! Due to the attic stairs (which make for a sloped ceiling in the guest room) we don’t think we can fit a pocket door there. Love the idea though! Haha! That would be cool if it didn’t cut into Clara’s closet (that’s as deep as the whole laundry area unfortunately. Love the suggestion though!